This year has been particularly hard for many reasons that only make sense to share one on one…this week I found myself reaching out and venting on a mom’s group about my currently chaotic and messy life of being pregnant & running after toddler, working full time between work and volunteering, all while trying to build a Tiny House…then being met with disappointed words or body language in relation to how absolutely long it is taking us to finish our Tiny House. That’s not to mention some of the more messy details inbetween. I got many sympathetic responses validating my feelings and it was nice to not feel like I was just whining saying, ‘Poor Ole Millennial Me’ for even just a moment…but having it confirmed to me that things are truly hard right now and it’s okay to recognize that. Though, I was also met with fellow mothers suggesting that maybe we should sell our Tiny House, count it as a loss, and move on. For a hot second I was deeply disappointed. Am I experiencing a death of a vision? Have I been a fool to believe that God was calling me to pioneer and foster a Tiny House Community? All I could think of was how stupid I am. 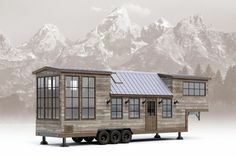 Fast forward to the next day, I’m meeting with a wonderful lady that is interested in purchasing a Tiny House. She heard about me and this project through the grapevine and was told to get ahold of me by calling Heritage. So we meet, we share stories of our life journeys and why we have made the decision to go Tiny…through these stories I was being reminded of very pivotal movements where I strongly believed that God was calling me to build a Tiny House Community to launch and foster fellow entrepreneurs and those with servant hearts. Even still during the conversation I could not get past the lies that were hurting my heart of not being the right person for this project of Biblical proportions. However, the more I talked, my passion and desire to bring affordable housing, businesses, and neighboring to my hometown of Shasta Lake could not be quenched. And then it hit me and as the day progressed…it hit me hard. Ive been operating in a poverty mindset and lack of vision. I’ve been so focused on how in the world can I possibly work harder and more – even beyond my personal compacity, just so I could pay for basic living expenses, pay for a midwife, pay for my car repairs, and hopefully have SOMETHING left over to finish the house. In the chaos, I’ve forgotten what it was like to dream. You know the dreams that are so beyond vivid in your mind that you can visualize every detail..and how those amazing wonderous feelings aroused by those ‘visions’ fuel something deep inside you that reminds you – you’re alive, you’re breathing, and this is the beginning of your journey to a beautiful reality. Everything we see…giant skyscrappers, incredible movements, intricate systems….all of it had a beginning. I’m sure some were rocky, some were emotional, and probably many more people with the same dream gave up before it became reality. I am NOT experiencing a death of a vision, I’ve just been slowly killing it. So I suppose this is where rubber meets the road, what now? What does living a life not trapped in a poverty mindset set look like? What does it look like to be vision driven? Not letting even fear of debt get in our way…but to take this as an investment, a launch forward. We talk about financial freedom like it’s simply being free from debt…but if I am driving in my car wondering if it’s just going break down any moment and I will no longer have a way to get to work…but hey, I’m debt-free, how is that freedom? If my 3rd move of the year is imminent and I am feeling no stability in my life…but hey, I’m debt-free, how is that freedom? But the huge piece of the Tiny House Community is and has always been The Tiny Townley House. Without that tangible piece of the vision, many people could not conceptualize our community. Once this is finished, hopefully very shortly, granted the loan is approved and the inspection company gives us the time of day…we will be able to finally introduce it to the people of Shasta Lake. To CAST VISION…to get locals, city officials, and donors on board! It’s one thing seeing sketch up models of floorplans, progress photos, and reading the community concept…but then it’s a whole other thing, walking through a Tiny House while allowing me to share may utter passion to you for my community. We need to finish this house now, especially in light of the horrible tragedy surrounding us with the Carr Fire… I desperately desire to offer affordable housing and do the hard work to create a community others can replicate in our town! I love Shasta Lake. I love Shasta County. And I will see it through that it thrives. This is our little contribution to the town we love.